Our marketing automation platform helps companies create marketing qualified leads and turn them into sales qualified leads. Integrated marketing tools make it easy to create omni-channel marketing campaigns, both offline and online, and set up key business processes. The platform is optimized to help your sales and marketing teams build better relationships with prospects, customers and partners while boosting productivity. Create trackable content, images, emails, landing pages, and more! Create trackable videos, measure video marketing ROI, boost conversions and send out video emails. Increase lead capture using our landing page designer and smart web forms. Distribute leads using any criteria based on performance, round-robin or direct. Create a DNA of your prospects that consists of a rich set of demographic, social and behavioral information. Build beautifully looking emails, handwritten letters, postcards, and more to use with automated outreach. Use qualification methods like lead scoring and lead grading to profile your database. Seamlessly participate in social media and track social ROI. With Lead Liaison, Select Energy Services has been able to increase their brand awareness and educate potential and current clients. They now have a single platform where they can manage all of their marketing communication, content creation, ROI reporting, and are able to align their marketing and sales teams better. 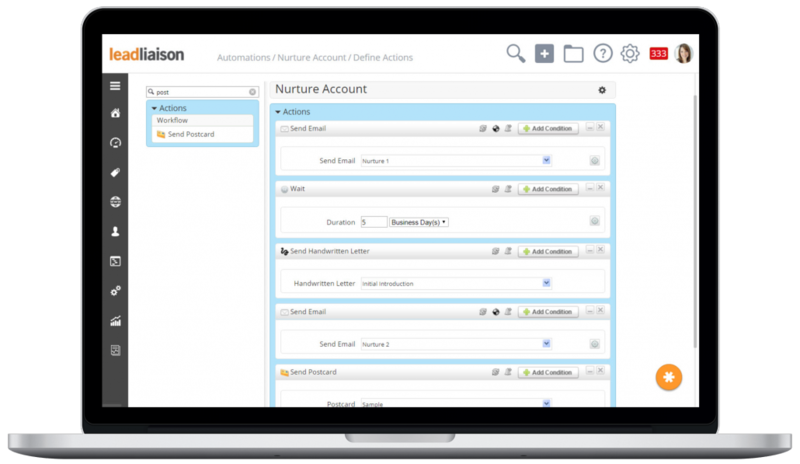 Click here to jump to a list of Lead Management Automation (LMA)™ Features. Lead Liaison provides the industry’s most advanced automation that will help your company establish process, structure, and scalability across sales and marketing. Hyper-target prospects based on engagement, demographics, and social info and trigger responsive marketing based on engagement. 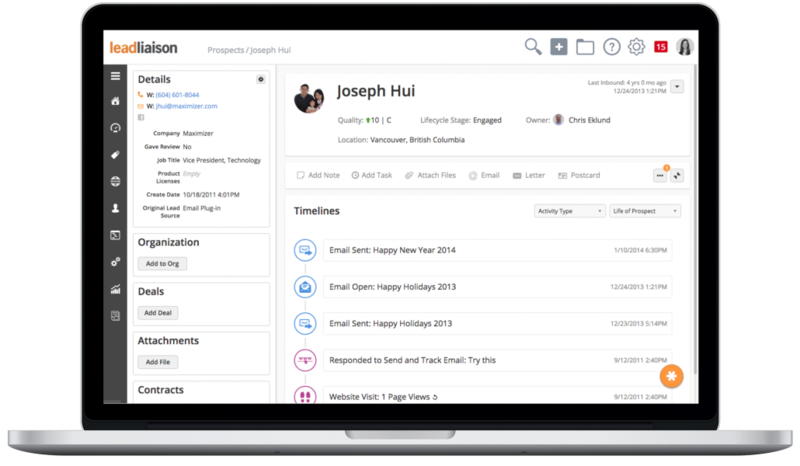 Lead Liaison’s intelligent marketing automation software tracks online behavior to build a rich-DNA of your visitors, called a Timeline. Behavior such as video watches, web form submissions, landing page views, email click-throughs, website visits, pageviews, document downloads, webinar attendance and more are tracked. 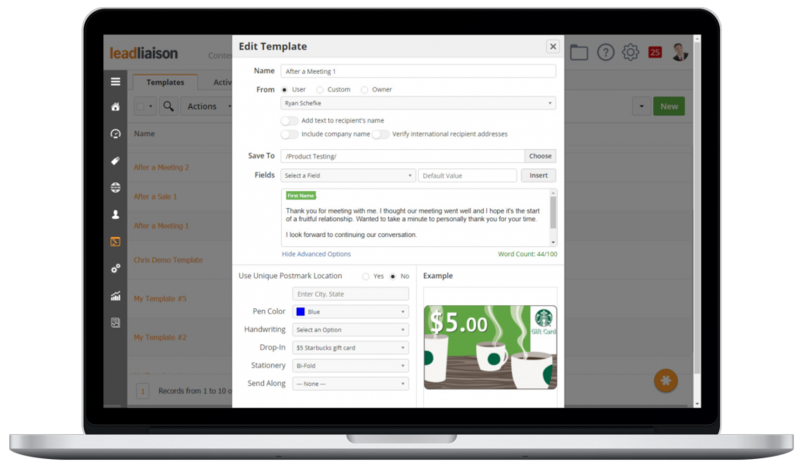 Salespeople will also receive daily lead reports and timely “Buy Signals” with all insight pushed into your CRM. Marketing teams are often times thought of as a cost center. Without a deep understanding of the return on your company’s investment in marketing, it’s impossible to defend the perception. 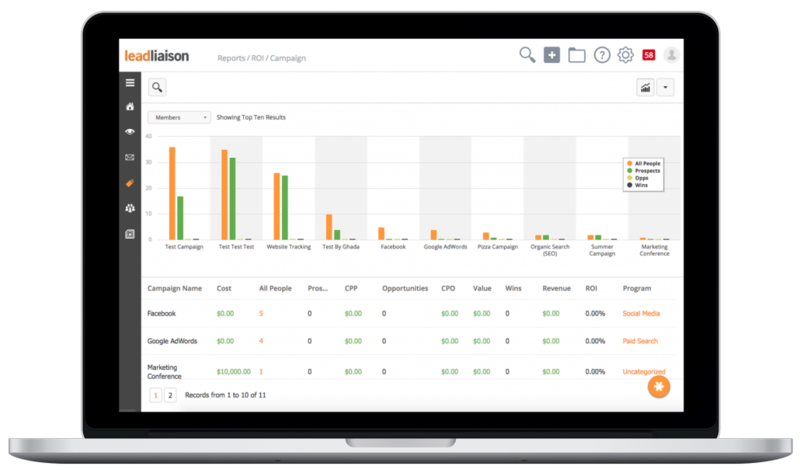 In depth ROI reporting will help you justify marketing spend and prove marketing’s impact. A powerful communications engine will assist you in sending out omni-channel marketing campaigns using email, postcards, handwritten letters, text messages, and more that build strong relationships with customers, prospects, and partners. Sales will love it, as touch points can be delivered on their behalf.